There are many factors to consider when planning your dive trip, including the marine life, travel logistics, seasonal weather, ocean conditions and distance between dive sites. This is a lot to think about, and likely the reason so many of us, especially photographers, forget to consider one of the ocean’s most important processes when planning a trip—the tides. 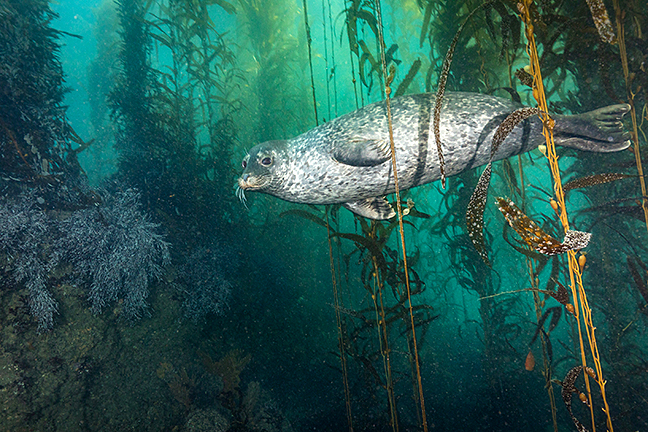 Harbor seal in kelp forest during a beach dive at high tide. Photo by Brent Durand. We all know that tides are primarily created by the moon’s gravity, raising and lowering the water level at the beach in daily fluctuations as the earth spins. The tides move in a pattern, making them predictable each day and in each season. The moon phase also corresponds with this pattern; full moon and new moon phases create the greatest differences between low and high tide. So, what does this have to do with our dive trips? 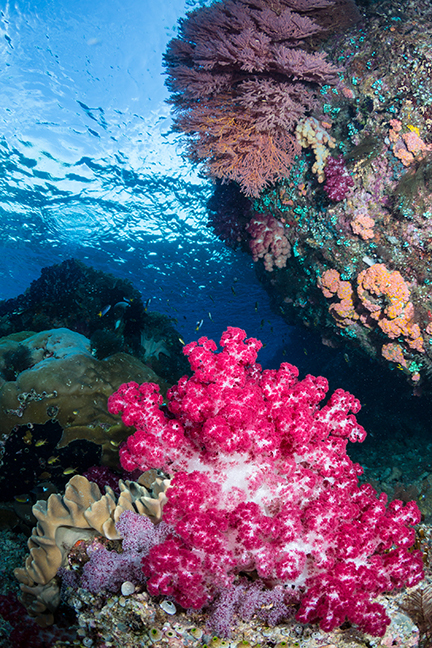 Simply put, almost every ocean dive destination has unique local conditions that change depending on the tide and currents. Cast spawning. 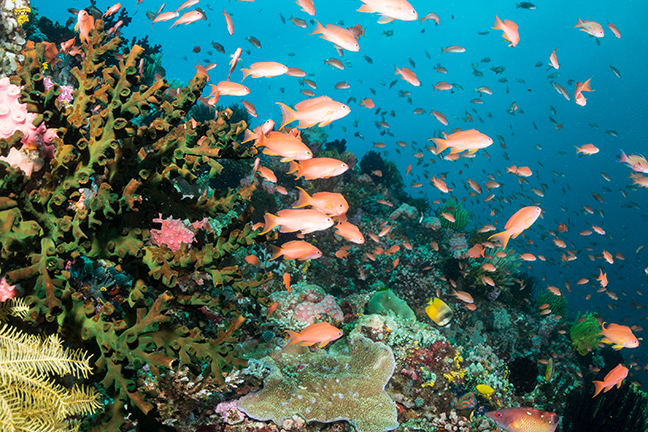 First, many critters on the reef reproduce through cast spawning. These cast spawners often choose to release their "contributions" during the new moon phase, when there is no moonlight to illuminate the eggs floating through the water column. The new moon coincides with larger tide swings, and eggs and larvae are often released during a strong outgoing tide. This carries them farther away from the reef and predators, ensuring a greater chance of survival. 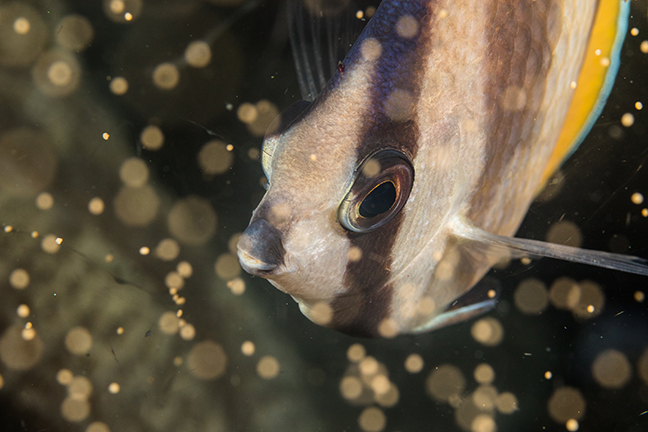 Naturally, incoming tides help carry the eggs and larvae back into the reef to settle. Pelagics. An incoming tide will also bring in some interesting pelagic invertebrates celebrated by black water divers and photographers. Visibility. Tides can also control visibility. Consider diving near the edge of a small group of islands, a bay or even in mangroves. An incoming tide will bring in clear ocean water while the outgoing tide will bring brackish water with more particulate. As a wide-angle photographer, this is really important to understand. I plan most of my California beach dives for the top of high tide since the outgoing tide will start pulling sand into the water column. Strong currents. In many dive destinations, you simply cannot dive during large tide swings. Strong currents might whisk you away into the ocean, while down and diagonal currents can present a serious hazard. If the #1 dive site on your list is subject to strong currents, it is best to plan your trip during a week with slack tides in order to have the best opportunities to dive the site. That said, we also need to consider the benefits of tidal currents on dive sites. We know that the current brings nutrients, which means that when the current picks up along a reef, the schools of fish appear. With the reef fish come larger predators like sharks and big pelagics! The key here is to make sure that the currents during your dive trip will be moving enough to bring the fish, but not so strong that reef hooks become a challenge to use. A good dive guide will be able to time the dive for optimal current. Brent Durand is a digital media content producer and publisher. 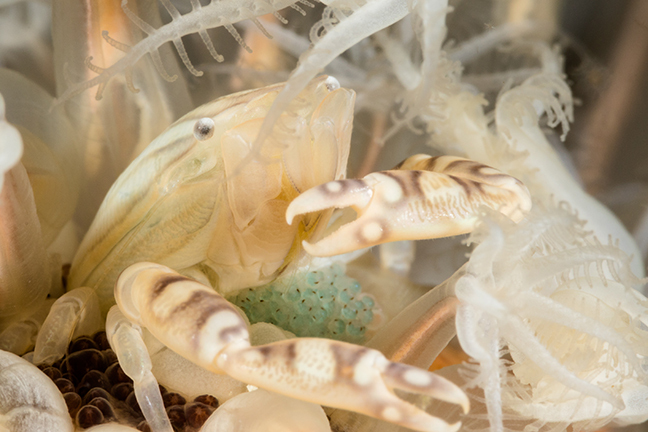 His work covers adventure from the snow to the oceans and the marine life we find there. His photography has been published in print worldwide, in advertising and across the web in a variety of outdoor industries. He has a reputation for writing insightful yet simple camera gear reviews, and speaks regularly on photography technique, dive adventures and trends in the photo industry. He has led underwater photo workshops in the Bahamas, California, Indonesia, Mexico, the Philippines and Sri Lanka, and has a popular monthly newsletter full of photo tips and tricks. He is also a dedicated brand ambassador for BARE Sports, Stahlsac and Kraken Sports. For more information, visit: BrentDurand.com.